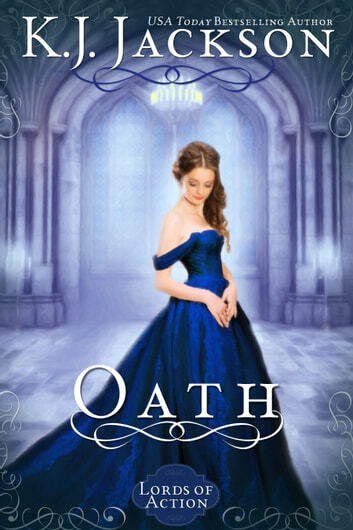 A well written but terribly sad book, Oath portrays the injustices towards woman in the Regency era - regrettably injustices that are still prevalent today . Lady Livia Canton has had her share of pain and suffering at the hands of unscrupulous men, and is on a mission to right the wrongs in society. Her quest takes her directly in the path of Tieran, Lord Reggard, to whom she was previously engaged. As the truth is revealed, it becomes clear that both parties have suffered from misunderstandings, and as motives emerge the lovers find themselves having to make fresh choices. The attraction between Livia and Tieran has not diminished one bit over over the years, but can Tieran accept the person Livia has become? I loved both Tieran and Livia, but the story itself was very uncomfortable to read. However, it does come to a satisfactory conclusion. I received a copy of this book from the author as a gift, and this is my honest and voluntary review. Another great novel from ms Jackson, I have read a number of her books and they never repeat the same scenario all fresh plots, this one with the kidnapped Liv trying to avenge all the innocent girls who are taken. I am sure anyone who enjoys a good romance will love this. Excellent story kept me up all nite. suspence mystery love alittle nautty i loved it .kj jackson great story teller iwill read all her books i can. awesome. This was a great read, good plot, well written book.